You know them. 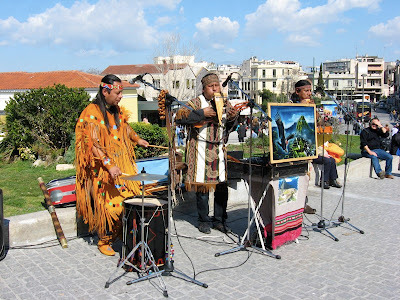 They’re in every city big and small— filling airports, street corners, and bus stations with their pan flutes, native rhythmics, and CD buying options. And they must do ok. Because either they’re well traveled or there are just thousands of these bands. I don’t know. They all sound the same to me. But I plan to start documenting each one I see. So here’s the inaugural group for my project—The Natives of Athens. They even have a nice painting as part of their act. It really sets the mood below the Parthenon.